Bob Morris Celebrates his win! Competitor Bob Morris prevailed at the 2013 Golf 4 Millions Challenge @ The Georgia Trail. 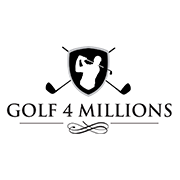 Bob a 40 Handicap Golfer landed his 110 yard tee shot roughly 8 feet from the pin to best 30 other competitors to win a brand new car from Golf 4 Millions!